Rev. Dr. Shannon Spencer speaks to volunteer servers at 12 Baskets Cafe. A year ago, I was arrested in Washington for disrupting the Senate as its members prepared to debate repeal of the Affordable Care Act. I was sentenced to 48 hours of community service. I went straight to 12 Baskets Cafe, where I’ve volunteered a couple of days a week since — long after my sentence was completed. Almost every Tuesday and Thursday, you’ll fine me standing near the door, scraping plates into a large compost bin. My position allows me to greet everyone who comes in and to make sure people have had enough to eat before they leave. I see all kinds of people, not just poor and/or homeless, but working people, retirees who want to stretch their budgets with some good, nutritious food. The cafe is in Kairos West Community Center off Haywood Road at State Street in West Asheville, and it was classed as a community center when the permits were issued for the cafe to open. Apparently, that changes everything. When you help people who have nothing, you become a “shelter,” and the city tries to shut you down. The excuse is that there’s a school nearby and people have found some used needles in the area. So, the cries of, “Save the children!” begin, as though no people who suffer from addiction should be allowed to travel in circles that come within a few hundred yards of a school or church. The trouble began when a group of itinerant people came through, enjoyed lunch and then set up camp in the side yard of the cafe. The television news came in and interviewed tourists across the street at Sunny Point Cafe, and the tourists didn’t like looking at poor people while they were on vacation. So, the local newspaper jumped on board to do a story and no one spoke to anyone from the cafe, even though there’s someone there who can speak every single weekday from about 9 a.m. to 2 p.m. The story just said no one was available for comment. So, viewers and readers are left with the impression that homeless people are doing drugs in the yard, that neighbors are at wits’ end with the chaos and cafe staff are allowing it, when the reality is that our neighbors support us. Some bring us food from their gardens, others come in and enjoy a meal. The problem here is that we live in a society that drives people into poverty with low wages and few worker protections and then vilifies them. Many of the people who eat at the cafe are working; some have disabilities that keep them from working. A number of them are in recovery from addiction, and some are still using. Every one of them is human. Every one of them deserves the dignity of a good meal and human contact. 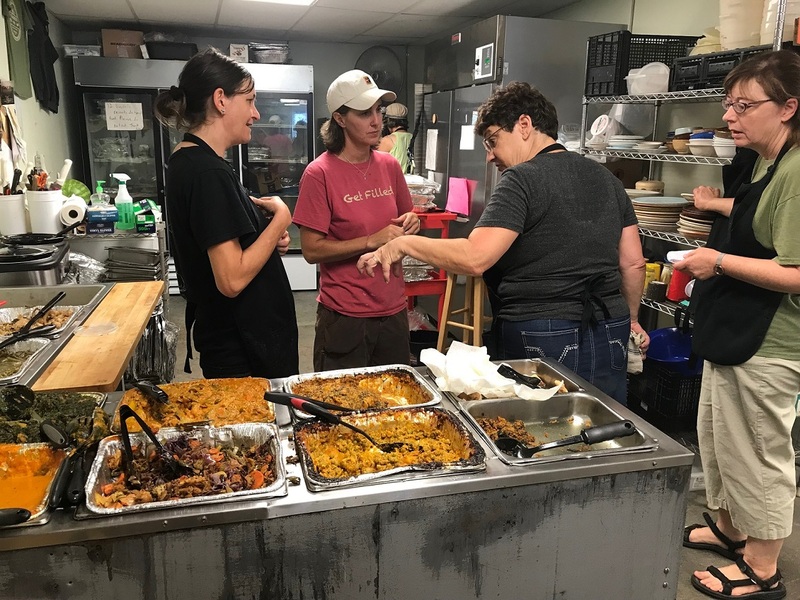 If we’re a community center when working people eat with us, but an illegally operating shelter when our patrons are poor, the problem isn’t with us, it’s with the community. If you want to know more about the cafe, come have lunch with us. The food comes from some of the best restaurants in town, from EarthFare, Mission Hospital and others. We seem to specialize in curry dishes from Indian restaurants’ buffets, but we have fresh fruits and vegetables, breads, muffins, pasta dishes … it’s different every day, and it’s all delicious. What’s more, the company is wonderful. Just because people don’t have homes doesn’t mean they don’t deserve respect and human contact. The name 12 Baskets, by the way, comes from the story of Jesus feeding the multitudes from 12 baskets of fish and bread. Yeah, if you have to ask what Jesus would do, the answer is in our name. He took 12 baskets of food and fed 6,000 because they were hungry. He didn’t ask whether they could pay, he just fed them.